Babies spend the majority of the time on their backs. Whether it’s when they’re sleeping, being held, or laying on the floor during playtime, placing them on their backs is natural. However, did you know they need ample time on their tummy too? If baby spends most of their time on their back, not only are they going to get bored very quickly, but they’re also going to have difficulties with development. Tummy time helps to build up muscle strength – something they’re going to need when they start to crawl. So, if you want to ensure your little one develops well, it’s important to mix it up a little and ensure they get some much-needed tummy time. Here, you’ll discover everything you need to know about tummy time and why it’s so important. What Exactly Is Tummy Time? Tummy time is basically where your baby is supervised while placed on their stomachs. It should only ever be done while they’re awake as studies have shown babies who sleep on their tummies are at an increased risk of SIDS (Sudden Infant Death Syndrome). Another reason why tummy time is so important is that if your baby spends too much time on their back, they may develop a flat spot on their head. If this does occur it isn’t usually permanent, but it does indicate that they aren’t getting enough exercise for their shoulder muscles, neck and head. When babies are placed onto their tummies, they constantly need to look around to see both objects and people. As they do move their head around, it ensures the skull properly rounds out and really strengthens the neck, trunk, and shoulders. It also strengthens the eye muscles too, so tummy time definitely has some pretty important benefits. When Should You Start Encouraging It? So, now you know just how important tummy time is, the question is what age should you start encouraging it? Ideally, you’ll want to start giving baby tummy time as soon as you take them home. This is recommended by the American Academy of Pediatrics and you can do it right after changing baby’s diaper or when they’ve just woken from a nap. However, if the umbilical cord stump hasn’t fallen off yet, you may want to delay starting tummy time until it has. This is because spending time on their tummies could irritate the stump. When you’re just starting out, it’s best to use tummy time 2-3 times a day for short periods of time. The sessions should last approximately 3-5 minutes each as your little one’s muscles won’t be strong enough to work out for longer periods of time. As they do start to build strength in the muscles, they’ll be able to partake in tummy time for longer amounts of time. What Should I Do If Baby Doesn’t Like Tummy Time? Although tummy time is important, that doesn’t mean a baby is going to like it! 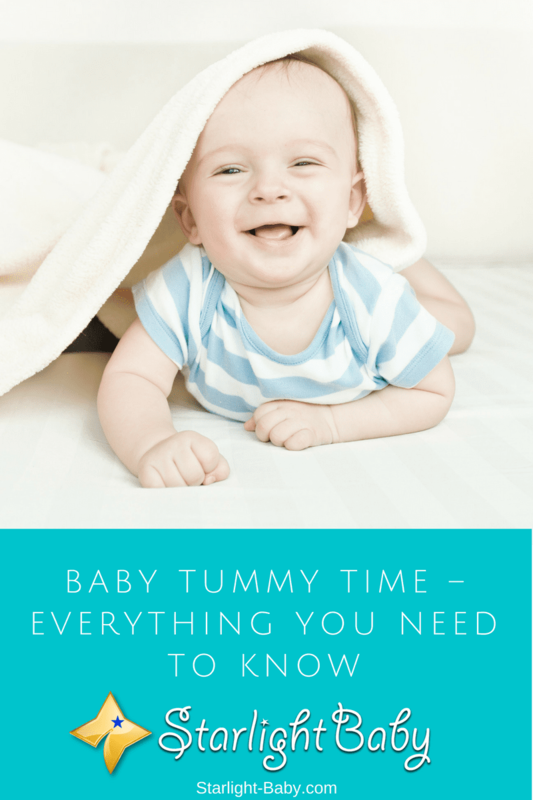 If baby doesn’t really enjoy being on their stomachs, it’s best to start doing it a minute at a time. Even if baby cries and fusses, tummy time is important and shouldn’t be avoided. With fussy babies, it’s important to increase tummy time gradually. You can also try to make it more fun by rattling toys and grabbing their attention. They will eventually start to get used to spending time on their tummies and enjoy the feeling over time. There are lots of ways you can encourage tummy time. While it’s easier to do it while playing with baby, they don’t necessarily need to be on the floor. Instead, you can put them on your lap, facing downwards. This is especially effective in the very early baby stages. If placing baby on the floor on their tummies, place a blanket down to ensure it’s comfortable. You’ll also want to ensure any pets are out of the room or at least not bothering your baby during tummy time. Also pay attention to any draughts which may be present as if baby is uncomfortable, they won’t enjoy tummy time. The Lie-Down Method – A great tummy time idea you can use on younger babies, is to lie down yourself and have baby on top of you on their tummy. Make sure baby’s head is facing yours and then talk to them. They’ll start trying to lift their head up to see you as you’re talking. This will help to strengthen the neck muscles. The Floor Play Method – Perhaps the most enjoyable and easiest way to encourage tummy time is to lay baby down on the floor to play. You’ll need to lie down too and place toys around your baby to encourage them to reach for them and look around. For younger babies, the goal of tummy time is to get them to move their head and look around to strengthen the neck muscles. However, from the age of 3 months, you can start trying to encourage your little one to reach for objects and push up onto their arms. This will also help to strengthen the arm and back muscles. At 6 months old, you can increase the difficulty of tummy time by placing objects out of their reach which they have to reach out to grasp. The above are just some tummy time ideas you can enjoy. Just remember, always place your baby on a solid, flat surface so there’s no risk of them falling. Your baby is also likely to become bored easily, so it can help to make silly faces or sing songs to them while they’re partaking in tummy time. Finally, the last safety tip you’ll want to follow is to pick baby up and place them on their back if they fall asleep during tummy time. Overall, tummy time is an important part of baby’s development. The above are just some ideas, but you can also ask your pediatrician for advice too. The key thing to remember is to ensure tummy time is fun for baby and the sessions are kept nice and short. It’s great to read about tummy time and it’s importance as regards the development of the baby. I never knew the reason mothers ensure that their babies spend some time lying on their stomach until that I read about tummy time and it’s benefits in developing the muscles of the babies. I’m happy to be learning so much from the blog on a daily basis. Great to hear you’re learning a lot from our articles, Henrywrites. Keep it up! We need more ‘enlightened’ men, haha. Babies need tummy time no matter how one looks at it. If you are very observant as a parent, you would notice that when they are still a month old, they normally have intestine problems, tummy bite etc. These tummy time helps settle these stomach problems to some extent. I could still remember one of my cousins who couldn’t sleep as a result of this stomach problems unless she is made to lay on her tummy, then she would be able to sleep. But as much as tummy time is encouraged, it shouldn’t be overdone. Parents should be very observant, the moment the baby is finding it stressful to be on its tummy, they should be taken off from such position because it’s now harmful to them at that time. When I read about the title, I thought the article was about feeding baby. Even though the article is different than I had expected, this is still useful for someone like me who is raising a baby. We never let the baby prostrate until he was three months old. We encouraged left and right side sleeping, but never let him sleep with his tummy and chest press. However, we encourage him to lie with tummy down when is is awake. You’re on the right track in raising your baby, vinaya. Keep it up!